MISSOULA — Lynne Blumberg, former Sentinel high school teacher and feisty friend to many, died at the age of 96 in Missoula on March 28, 2019. 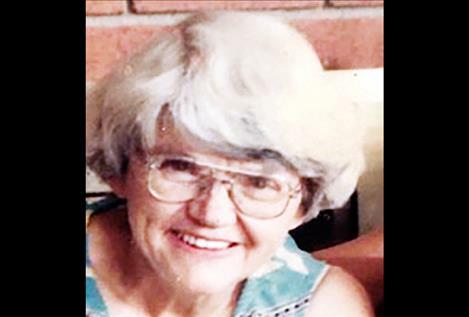 She was born Lynne Mildred Stout on Jan. 3, 1923, on a farm near the badlands of South Dakota, and that rugged terrain, she said, served as a private playground for herself and her three older brothers: Roy, Bernard (Bun), and Patrick (Patsy), all deceased. They walked to a oneroom school and found their way home during blizzards by holding onto fences. Winters were harsh, but Lynne remembered the way the spring brought wild flowers, the trill of the mountain lark, and the fragile beauty of gumbo lilies. Girls were not allowed in the barnyard or fields where work was being done, so Lynne devoted herself to “reading, writing, and thinking.” She called these her “favorite ways to connect with the world.” Even retired, with failing eyesight, she kept the Helena Library for the Blind busy sending her books on-tape, and she listened to them for many hours every day. Lynne’s youngest daughter, Josephine, died in 2001. “A person never gets over it,” Lynne said. “It greatly lessened the serenity of my final years.” But always, Lynne remained what she was, a tough, farm-bred, mid-Western, stoic: a resolute South Dakotan who never once complained about the trials of aging. Lynne Blumberg is survived by a half-sister, Ava Gene Wendt; by her daughters, Janet Leslie Blumberg of Bothell, Washington, and Jenifer Lyn Blumberg of Charlo; her seven grandchildren: Laramie, Kiam and Adam Loewen, Asher Loeb (Tahra Cerutti), Ariel Diaz (Victor), Aram Loeb (Julie), and Caleb Knedlik (Janine) and also her eight great-grandchildren. Lynne requested no flowers or memorial service; such things “had never been important” to her. The family would like to thank the incredibly caring staff at Riverside Health and Rehabilitation and Partners Hospice.